Have any 3 Rebel LEDs mounted to our thermally efficient, 20mm Tri-Star CoolBase. You can order one or order thousands, there is no minimum order requirement or extra fees. Orders for custom color mixers cannot be canceled or altered once your order has been reviewed and submitted to production! So be very sure that you have selected the correct LEDs before you submit your order! Custom color mixers are subject to special order terms as detailed here. Before you order cyan LEDs, please be sure to read this important information about color variations. 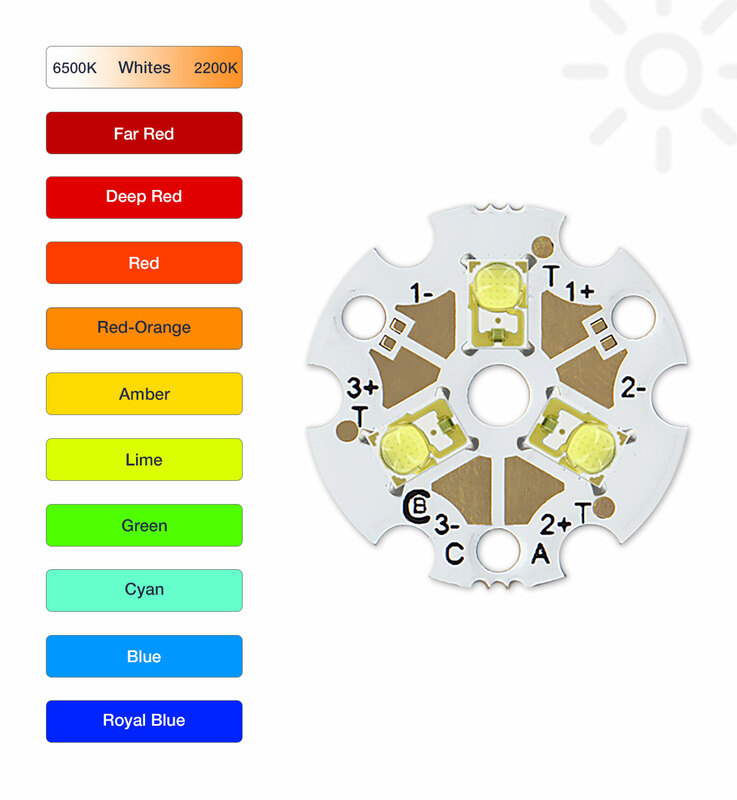 Bases are configured to power each LED separately for controlled color mixing, however you can easily convert the assembly to power all three LEDs in series with two solder dots. See the connection diagrams below. 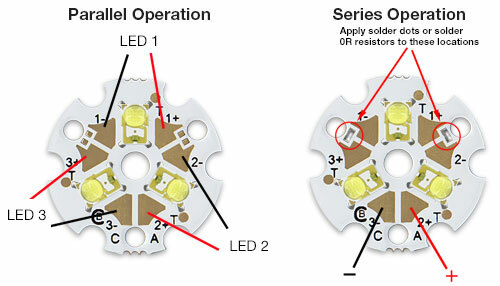 The CoolBase SR-03 Tri-Star module requires careful attention to mounting and cooling to ensure that the junction temperature of the LED is kept well below the maximum rating as specified in the LED documentation published by Lumileds. If you order more than one piece of this part, pieces may be shipped as part of a routed panel with v-scored tabs for separating the parts from the panel.